Blood pressure and heart rate are related to each other. Blood pressure is the pressure exerted by the blood on the arteries of the body. Blood pressure is the key force that drives blood flow through the body from arteries, into the organs and then into veins. Pumping of blood by the heart generates blood pressure. Systolic pressure is the amount of pressure generated by heart while pumping the blood through arteries and diastolic pressure is the pressure of blood inside arteries when heart is at rest. Low diastolic blood pressure has been linked with increased cardiovascular risk. Diastolic blood pressure fluctuates depending on the physical exertion and other strenuous activities. Regular monitoring of blood pressure is essential to determine the average reading. Average diastolic reading less than 60 mmHG is considered low diastolic blood pressure and this condition is also called hypotension. In low diastolic blood pressure condition, the blood flow to the body tissues and cells is decreased, and hence the supply of nutrients and oxygen is also reduced. Among elderly people, low diastolic blood pressure accompanies cardiovascular disease. The causes of low diastolic blood pressure include stiffening of arterial walls, abnormality in coronary blood flow, side-effects of medications or any other underlying medical condition such as organ inflammation or dehydration. If low diastolic blood pressure is ignored for long, it can lead to cell damage. Nausea, light-headedness, and vomiting are some of the common effects of low blood pressure. Sudden dip in the blood pressure can be dangerous, and just a change of 20 mm HG can cause nausea, dizziness and fainting, as brain does not get required supply of blood. If the big plunge is due to severe infection, uncontrolled bleeding or allergic reactions, the condition can be life-threatening. 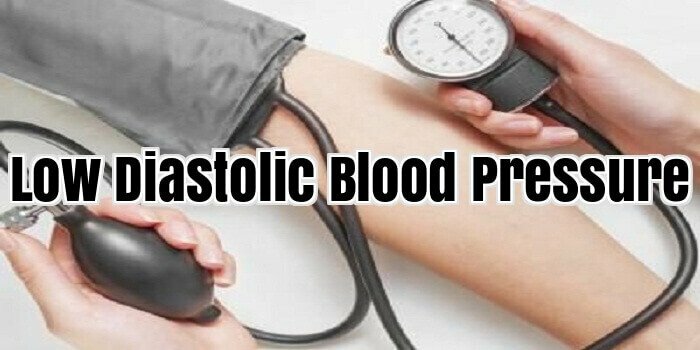 If suffering from low diastolic blood pressure, the aim is to raise the blood pressure using various means such as taking more salt, wearing compression stocking, drinking more water or with the help of medications. To treat low diastolic blood pressure, you must follow a healthy diet, which is the right combination of various foods, and avoid high-carbohydrate diets. To reduce light-headedness or dizziness, try changing the body positions slowly. Take few deep breaths before getting up from lying down position. Some of the treatments for low diastolic blood pressure include balloon angioplasty, dialysis, carotid endarterectomise and carioverions. Commonly prescribed medications and drugs to treat low blood pressure are Pramlintide, Insulin, Glyburide, Glucagon, Mecasermin, and Human placental lactogen. Ackee, vitamin b12, gymnema, and Brewer’s yeast are most commonly used herbal and natural treatments for low diastolic blood pressure. Blood pressure is measured by wrapping a band, called a cuff, around your arm, pumping it up, and listening below the cuff for two sounds as the pressure in the cuff is released. The first sound is a thump, thump, thump of the heartbeat; that gives a high number, the systolic blood pressure. The second sound is a steady flow when the pressure in the cuff is low enough to let the blood flow smoothly; that is the diastolic pressure. Blood pressure is expressed as a ratio of systolic over diastolic. For example, your systolic might be 140 and your diastolic 85. That’s simply expressed by the physician as 140/85. If your blood pressure is regularly more than 140/85, you should take steps to get it down. In my opinion you should strive to keep it below 130/80. When your diastolic blood pressure is consistently over 90, you’ve got hypertension. In my opinion, you should start paying attention when it’s consistently over 80 and absolutely when it’s over 85. You might get the idea from this that hypertension is not a clearly defined illness; you’re correct. At a diastolic of 90, your doctor will say you’ve got it! But between 80 and 85, he might not even say “watch it,” and from 85 to 89, he might say its “high normal.” I propose that anything over 80 should be treated seriously. People usually learn they have high blood pressure in one of two ways. It either seems to develop under the doctor’s watchful eye, or it’s “there.” Let me explain and you might see yourself in these situations. In one case, you go in for a check-up and the doctor or nurse takes your blood pressure a few times, asks you if you’ve been tense lately, or under stress, and tells you to drop by in a week or so to have your blood pressure taken again. You’re assured that it’s nothing to worry about; they’re just checking. The next time it’s still elevated and you’re asked if there’s a history of high blood pressure in your family. It might even be suggested that you lose a few pounds, cut back on salt, and cut back on alcohol. It often continues this way for months, up to a year or two before it’s decided that you’ve got high blood pressure. In contrast, the doctor or nurse takes your blood pressure a couple of times and immediately starts asking if high blood pressure runs in your family. You find out all at once that you’ve got high blood pressure. Indeed, it could be 140/93 or even higher, and there’s no doubt in your doctor’s mind. In both extremes, you feel fine, not a sick day in your life. That’s why we call high blood pressure the “silent killer.” High blood pressure does have symptoms, but they are so minor, so insidious, that they become “normal” to you and you never realise you are developing a serious disease.